Hang-on tree stands are a great addition to any hunting kit. They’re built to be stable, comfortable, and portable. It’s crucial that you find the best one that suits you, as you’ll be spending hours on end sitting in this tree, so it’s important that you’re comfortable. The following article will discuss the various products on the market that we think are the best and what it takes to find a great hang-on tree stand. What Makes a Great Hang-on Tree Stand? Like all great products, there will be particular features that allow it to stand out from the rest. These features are what make it special and better than the others. The following section will discuss the various features that you should be looking out for before buying your next hang-on tree stand. Comfort is a huge priority for any hunter that’s used a tree stand before. You could be in that tree for a few hours and the last thing you want is a bad back. Therefore, you should ensure there’s suitable padding and the seat has decent back support and not just a thin belt feature. This also should cover if you’ve got enough room to take standing shots. Optimally, the seat should flip up to provide you with more room. Safety features should also be included in the seat that will ensure any risk of falling and hurting yourself are severely limited. Some manufacturers include harnesses or even have multiple safety straps that can be secured to the tree. These safety features should also include adequate weight support. Some of the best tree stands on the market can support around 300 pounds of weight. The weight of the tree stand is also an important feature. Everyone wants something that’s portable and easy to set up. This isn’t always the case, so you should look for something that weighs the least possible. The material of the tree stand is another indicator of how much the product might weigh. You want something that’s light but doesn’t sacrifice the durability of the product. The most important part of the article is the review section. This is where we provide you with an in-depth description of each product we believe is the best currently on the market. We’ll also discuss the various pros and cons of each tree stand. This tree stand is without a doubt the best currently on the market. The product offers plenty of room for moving about and finding the perfect angle for that next shot. The two tree straps can be secured to fit trees between 4 and 22 inches in diameter. One problem most hunters find with tree stands is the poor maneuverability due to the lack of space while aiming for a shot. This tree stand allows you to adjust the seat by increasing the height or even packing it up straight to create more room. One of the best points about this product is that it only weighs 14 pounds and can support weights of up to 350 pounds. 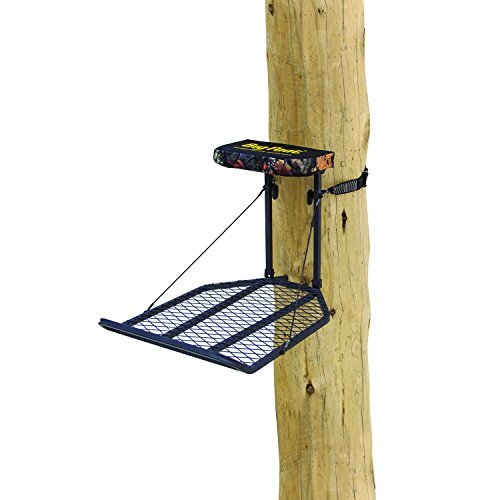 This tree stand can offer a range of benefits that don’t come with other versions. A big problem for hunters is the comfort. 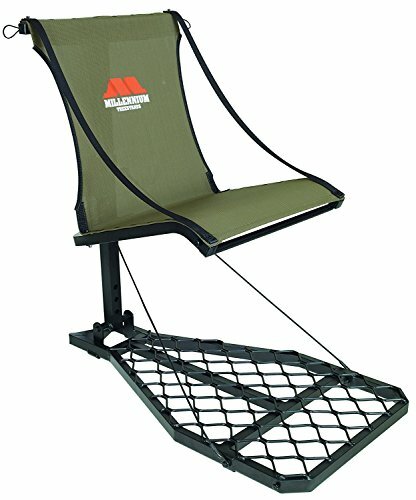 Staying in a tree for hours without a comfortable seat is a huge problem, and this tree stand fixes that with the padded foam seats. You can also adjust the seat which creates extra room. Another complaint of hunters was the small platform. The portable design means that you’ll only be carrying an extra 14 pounds of weight, but this can support anything up to 350 pounds, which is far more than your average tree stand. The only downside to this product is that it doesn’t offer back support. Slouching in your seat is a big problem and can cause a few health issues with posture so an added backrest on the seat would be a huge advantage. This tree stand was voted runner-up in our list, a strong contender for best overall. A problem for many hunters using tree stands is that they don’t have enough space to find the best angle to take their shot. With this tree stand, you can adjust the height from 16 inches up to 20 inches, and the full seat can also be flattened out to offer more space for that crucial shot. Unlike the previous product, this tree stand has a backrest that will provide extra comfort for those using it. This saves you from that back pain after hours of sitting in the same position. 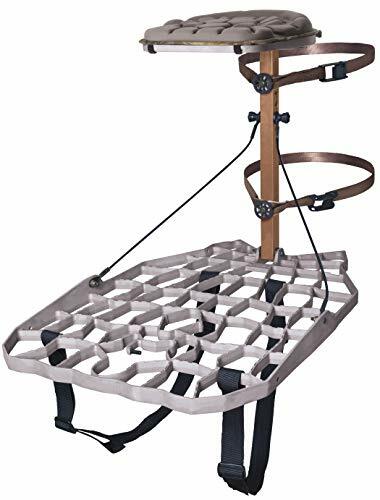 This tree stand can withstand 300 pounds of weight and is made from high-grade aluminum, which offers you a lightweight portable tree stand that only weighs 19 pounds. As runner-up, there are plenty of benefits that come with this product. The lightweight aluminum provides enough strength to hold more weight than most other tree stands, as well as, only weighs 19 pounds. A huge downside of many tree stands is that there is limited space. However, this tree stand allows you to adjust the seat in order to offer more space for those standing shots. The seat also has a backrest, which is great for anyone that doesn’t want to get a sore back from slouching for hours. The only downside of this product is that even though the seat can be adjusted, the platform still doesn’t offer as much space as other tree stands. The lightweight aluminum structure can support a weight of 300 pounds and only itself weighs just under 20 pounds. This lightweight material will allow you to carry the tree stand deep into the woods for those harder to reach game trails that only a few know about. The noiseless strap system also limits the noise that’s made from moving around and metal hitting off each other during your setup. The cushioned seat adds some decent comfort for anyone that’s going to be sitting in the same spot for the next few hours. The seat can also be adjusted for those standing shots that require more room to find a decent angle for your shot. The edge of the stand sits at a 45-degree angle, which offers you a footrest for extra stability and comfort. 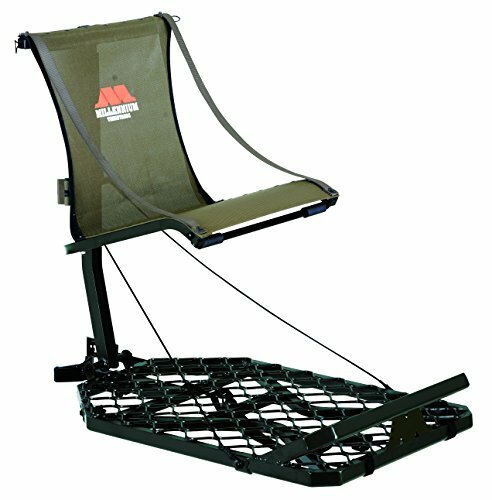 The lightweight tree stand only weighs 20 pounds, which is on the lower end of tree stand weight, making this product extremely portable. The strong structure, despite being incredibly lightweight will be able to hold roughly 300 pounds. The noiseless strap system limits the noise that you make when moving around on your tree stand, which can be a pain when the different metal parts connect and scare away targets. The cushioned seat is always a benefit as it adds the needed comfort for hours-long hunting trips in the trees. There’s also a 45-degree footrest which adds that extra comfort and stability. The only downside to this product is that there’s no backrest which could limit any back pain or slouching. The other downside is much greater and serious, as the product only has one tree attachment strap when most others have two or more. This is a huge safety flaw. However, you could always just buy additional straps to increase stability and safety. We aren’t lying when we say this is the lightest tree stand on the market currently. Weighing in at only 11 pounds, your one-year-old child could probably carry this on their back for you. You’ll also benefit from plenty of room as the platform measures at 26x19.5 inches, making those more complicated shots a little easier. This platform can also withstand 350 pounds of weight and fits itself around trees from 4-22 inches in diameter. 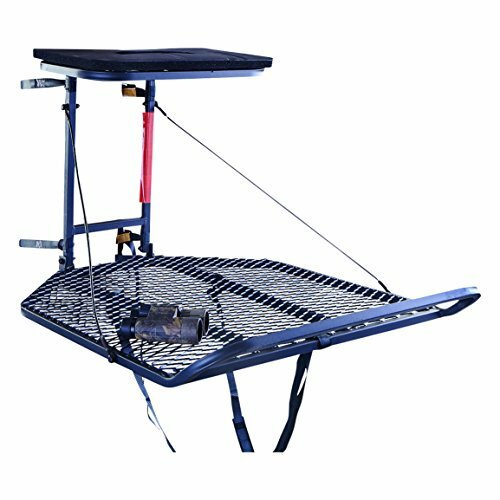 This tree stand also comes with a handy built-in bow stand which you can rest most bows on. The product also comes with a cushioned seat that offers great comfort for those hunting over long periods like a few hours. This product is made from high-grade aluminum that can withstand 350 pounds which is far more than what any other tree stand can hold. Although the tree stand can support a great amount of weight, it’s extremely lightweight, weighing in at 11 pounds. The greatest benefits are the lightweight and portability of this tree stand. There’s also plenty of space to work with on the platform, as well as a bow rest, which is a unique addition to a tree stand. The only downside to this product is that it hasn’t got a backrest for added comfort which would be a great support feature for any tree stand. The lightweight structure is mainly thanks to the high-grade aluminum that’s used to make the product. This property allows for you to carry around your 11.5pound tree stand with ease. Although it’s made from lightweight, yet strong, aluminum, this tree stand can hold 300 pounds of weight. The seat is similar to that of a sun lounger which means it has a great backrest for added comfort. The material used on the seat allows for your body to sink and adapt to the design of the seat. Most people rate this as one of the comfiest seat designs they’ve had the pleasure of sitting on. This tree stand is a basic unit that will do the job perfectly. Its lightweight aluminum design will allow for extra portability and an easy setup process. The strong material can support weight up to 300 pounds, the standard for any tree stand. 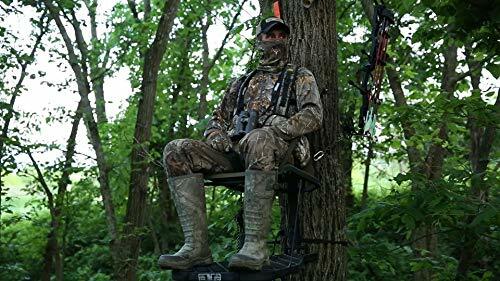 The greatest benefit of this tree stand is that it’s got the comfiest seat on the market. The sun lounger-like design allows for great comfort for your backside and back area. The only downside to this product is that it’s got a small platform which can be annoying when you’ve got limited room to adjust for a better shot. The heavy-duty steel construction will allow for the product to withstand even the heaviest of hunters at 300 pounds. Offering you a huge platform space for any shots that you might need to move around for, you’ll never complain about the lack of space with the 30x36-foot platform. The foam seat offers a great way to relax and get yourself comfortable for the many hours you’ll spend up in the tree. The product includes backpack straps, which means you’ll be able to haul your tree stand far easier now. Along with that, the product also offers strong platform cables for stability and fall-arrest safety and ratchet straps for extra security. The product weighs in at 21 pounds, which is why you’ll benefit from the backpack straps. The heavy-duty platform means that you’ll feel safe whenever you’re on the edge trying to get the perfect shot. Something that you’ll never need to worry about is the lack of space to find that shot, as this is one of the largest platforms that you’ll find on the market. However, this comes with a major downside which would be the 21 pounds of weight that you’ll need to put up with. Although you’ll have some helpful backpack straps included on your tree stand which will help you haul it up. The foam seat is another huge advantage like we spoke about before, as this adds comfort. The only other downside would be the same reason for many others, which is that it does not have a backrest. Once you get the hang of setting up your tree stand you’ll be able to set it up within minutes. However, for everyone still learning, we’ve put together a step-by-step guide on how to safely secure your tree stand. Start by taking your tree stand climbing sticks off quietly and securing them to the tree. Once you have the first two secured on to the tree, give them a test to make sure they’re fastened properly. As you move further up the tree, you should use your tree climbing belt to move up and install the remaining climbing brackets. Once you are set up with your climbing brackets, it’s time to install your tree stand. Firstly, place it into the direction you’ll be watching over the most, like a game trail for example. You also want to place it not too far up from your last step. Start off with the top strap. This will add extra stability and make installing the rest easier for you. A tip to make it extra secure is to lift the platform up flat and then tightening the strap even further to make sure that it’s as tight as possible. Do the same for the remaining bottom strap, wrap it around and any remaining straps should just be tucked in for extra security. 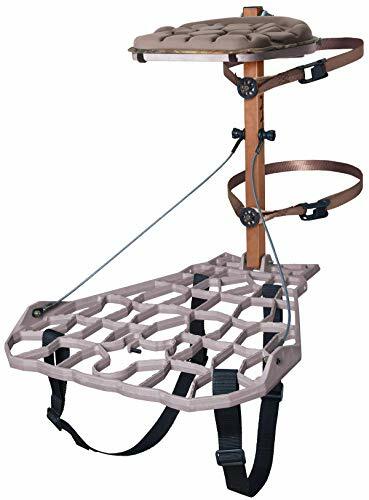 By this point, your tree climbing belt will be underneath the tree stand, you can use another harness to secure yourself above the stand in order to then move up on to the stand safely without risk of falling. If you need more information or just learn better from watching someone do it, you can watch this Youtube video which gives you an in-depth guide on how to set up your tree stand safely and securely. There are various types of tree stands to choose from, all with their own benefits and downsides. Sometimes it can be hard to understand what to look for, but, if you think about it, the main priority of a tree stand is to be comfortable. You’ll be spending hours upon hours on this platform and if you feel comfortable, it makes the wait a lot less daunting. Overall, we hope this article has helped you find your next tree stand. This section is important for all those people that are still left with a few questions after reading this article. To help, we’ve compiled a few of the most commonly asked questions and answered them the best way can. How Big and Heavy is a Tree Stand? Obviously, there are a few different sizes and types of tree stands that will all have different weights. You can find tree stands that weigh up to 29 pounds or as little as 11 pounds; it all depends on what you’re comfortable with carrying. Most of these products can support an average of 300 pounds. What is the Total Weight of a Tree Stand? The total weight of each product will vary depending on their features and what materials are used to make them. Like we said previously, these products usually weigh between 10 pounds and 30 pounds. Just as a reminder, you’ll be carrying these stands on your back until you find the best tree for the stand to be set up and ideally next to a game trail. So choose your stand with this in mind. How High Do You Need to Be in a Tree Stand? You should be up high enough that you can get a decent view of the surrounding area. You’ll most likely have four stepping brackets to use, so set all of them up securely around the tree and then your tree stand should be set up just above the last stepping bracket. You don’t need to use all the brackets if your view is going to be blocked by branches. The perfect place would be just below where the branches start. What is the perfect time to hang deer stands? Well, that is a tough question with many varying opinions. I usually hang them in mid-summer. By mid-summer foliage is at it’s peak. Deer trails are pretty easy to find and you’ll see where cover is most abundant. It’s a good idea to rough in access trails in the spring. This is a good time to break out the chain saw if you need it. Deer will have plenty of time to recover from the intrusion. However, don’t do your trimming. Vines and small branches will often grow back by the time summer and fall arrive. In July & early August I’ll enter the woods with my stands, pole saw, hand saw, and pruning shears. Pruning shears are usually relegated to work around the house but they are incredibly effective for cutting in shooting lanes and creating mock deer trails. I can clear paths with a set of pruning shears much faster than I can with a hand saw. The hand saw is only used for cutting trees too big for the shears. Start from the tree you’re going to hang the stand in and work away from it. If an entrance trail is needed, think about the best way to your stand based on prevailing winds. Try to base your shooting lanes on where you expect deer to pass by your stand. After everything is roughed in from the ground level, set the stand and climb into it. If there are any branches that need to be removed to ensure a safe, quiet climb up to the stand, now is the time. Once you’re in the stand cut off anything that will impede your shooting. But try to leave some cover behind you to break up your silhouette. However, where we think deer will come from isn’t always where they appear. I’ll cut a few small shooting holes in behind me just in case I get snuck up on. I had a very nice buck come in behind me last fall and had to watch him walk away from inside 20 yards because I didn’t have a lane behind me. So when is the perfect time to set stands? It’s hard to say. I put most of mine in from mid-July to mid-August. Some people leave their stands in the tree all year long. I don’t recommend that for a few reasons. Most importantly, limiting the amount of exposure to weather your stand receives will extend it‘s life and keep you safer. Secondly, trees expand and contract throughout the year due to changes in humidity. If your straps are secured tightly, they could injure or even kill the tree when it experiences it’s natural expansion during summer months. I have several stands hung in areas where there are only a few trees big enough to support a hunter in a stand. I can’t afford to kill one. If I’ve hung a stand in mid-July, I just pull the straps tight when I climb in for the first time in the fall.